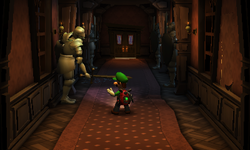 The Guard Hall (Guarded Corridor in PAL regions) is a room in the Gloomy Manor in Luigi's Mansion: Dark Moon. This room can be accessed by going into the north door of the Entrance. In this hall, there are multiple suits of armor that wield their sword in front of Luigi if he tries to walk past. If Luigi is hit by these swords, he loses 20 HP. Luigi must instead run past the knights to avoid them or approach them until they swing their sword. In later missions, mice will crawl around the room, getting in the way of Luigi's progress. This hall leads to the Foyer. In mission A-3: Quiet Please, all the suits of armor disappear by means of Spirit Balls. Coming back to this mission and using the Dark-Light Device to reveal the statues makes 47 bills appear, making a total of 235 G.
This page was last edited on May 1, 2017, at 20:56.